An alternative I have come up with is a steady supply of plush toys as an alternative. The thing is, the moment I got them, I realized just how nice they really were, even as a gift to myself. And then we found Blabla. 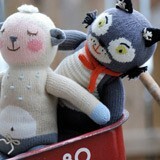 The Bla Bla collection of plush toys are all designed by an artist called Florence Wetterwald. They are all hand knit in Peru which will explain why they are slightly more expensive than the norm. When you see them and feel them you will understand something of why I consider them to be fairly superior plush toys. This is a very cute plush toy cat made by the wonderful BlaBla brand. It comes in two sizes - a mini doll at 12 inches so just right for a baby's hands or it can be as large as a toddler (22inches long). The stitching and knitting on this plush toy cat is so exquisite and the attention to detail is really something. Most importantly if bought for a young child, these plush toys are very easily cleaned. You can either put them in the washer on a gentle cycle or hand wash (I know which option I would go for!) You just need to make sure you dry it flat, the dryer really is not an option. This is a huge cat plush toy. It comes in at 3 foot tall so is more like a human child sized toy. It is blue with charming colorful dots all over and a friendly looking smile on its face. It comes holding another little cat in his hands. 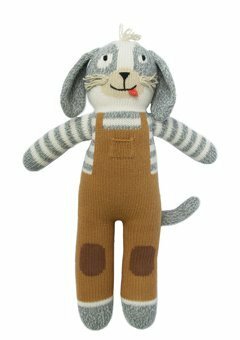 This would be a suitable gift for any person big or small who loves plush toys. This cat does come in a range of sizes. there is the giant sized cat to the left here and look below to see the mini which is around 12 inches tall and the large which is around 22inches. And this one is for any fairy or princess lover. My girls just love anything fairy and this really appeals to them. The other thing about Blabla is its dedication to providing plush toys that are created to very stringent requirements. Any parent can be sure that even if these toys are mouthed, their child is still safe. This fairy is available in two sizes - mini or large. 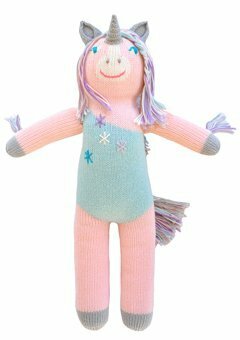 Just click on the image to find out more about this lovely plush fairy doll. This is a playful mermaid which also has the personal touches of being hand knit in Peru. It would suit a little (or big) lady who enjoys things like 'The little Mermaid'. Her hair is made of natural fibers as is the rest of this plush toy. Please click on the image to find out more and to obtain the doll. Blabla actually also has a range of mobiles which would be excellent gifts for a new Mom. They look pretty adorable really and can only bring pleasure to any little baby as it lies looking up at these lovely animals. The thing is Blabla does not just produce a sheep mobile, there is a blue bird mobile, a pink bird and a jungle mobile. The jungle mobile is particularly nice as it has an array of jungle animals. Blabla Fox Knit Plush Doll Orange Sweater Tie Socks Knitted RARE! Blabla not only makes plush toys, they also make bags and more to complement their plush toy collection. This is a really cute butterfly which any little girl will love to carry on their backs. My girls just love to carry their Blabla bags around as they are so soft. Blabla is an ethical company that is producing a whole range of great items that will be enjoyed by both young and old.